Use the power of hypnotherapy to Discover the Joy In Housework – it’s easier than you think! You’ll see a new you and you’ll feel great about it!!! Steve G. Jones, Ed.D., Clinical Hypnotherapist, charges $1,500 for a custom recording and $25,000 for a one-hour private hypnotherapy session at his office. But you can get all the benefits for this low price. Simply listen to the Discover the Joy of Housework Hypnosis MP3 every night as you go to bed for three weeks and feel the changes happening in your life. You will feel more empowered, more in touch with your true self, and you will truly know that your goals are within your reach. Steve G. Jones achieves AMAZING and LASTING results!!! The Discover the Joy of Housework Hypnosis MP3 session is the easiest way to affect change in your life because the positive messages go straight to your subconscious mind effortlessly so you can accomplish your goals and reach for the stars!! All you have to do is listen to the mp3 at night as you go to sleep!!! You’ll hear soft music, the gentle sounds of the beach, and the soothing sound of Steve G. Jones’ voice all working together to bring about positive changes in your life easily and naturally. And as you continue to drift and relax deeper, deeper and more deeply relaxed, you realize that you truly enjoy doing housework. You realize how satisfying it is to have clean, beautiful home. As you continue to listen to this recording night after night, you become more and more motivated to do housework. And as you continue to relax, I want you to imagine your home in perfect condition. Imagine that everything is spotless. The windows are glistening clean. The hard flooring is shiny and the carpet has not a speck of dirt. Imagine that your kitchen is clean and everything is in it’s place. Continue to walk around your home noticing how wonderful it looks. The feeling you get when you see your house in this pristine condition makes you so happy. You take a look at your uncluttered table tops and there is not a speck of dust. This makes you smile to yourself. You walk from room to room and you notice that all the clothes have their place inside drawers and all the beds are made. Everything looks so nice. And as you come back to the present, you realize that these images of your perfect home motivate you. It’s okay if your home isn’t perfect all the time, but whenever you take time out of your day to clean, you enjoy every second of it. You have renewed energy to clean your house. You now look at housework in a different way. Your time spent on cleaning is now a time for you to escape. You take this time to yourself to enjoy cleaning, because you love the results. You do great work and it shows with your cleanliness. Perhaps you listen to music while you do housework. This allows the time to pass by quickly and before you know it, you have accomplished so much more than you ever felt possible. Or perhaps you watch TV while you are doing housework. In order to stay motivated, you eliminate procrastination and you accomplish something everyday. Every day you have a manageable amount of housework to do and you enjoy this time. Imagine yourself one day in the future. On your to-do list you have three things to do. Imagine yourself doing these three things and it only takes you thirty minutes. Perhaps you unload clean dishes from the dishwasher for five minutes. This makes you happy, putting all your dishes in their designated places. And perhaps for twenty minutes you clean a bathroom. You joyfully clean the toilet, bathtub, sink, and mirror. You take a look around the bathroom when you are finished and you realize that everything is sparkling clean. You feel a sense of accomplishment flow through your body. And perhaps your last task for this day is to vacuum a room. When you are finished, you realize that you have accomplished a lot in only thirty minutes. You quickly discover the joy in doing daily tasks. Every time you prepare something in the kitchen you clean up after yourself so that there isn’t that much to do after you have enjoyed your meal. You take time to enjoy eating your food and then when it is time to clean up after the meal there are only a few things to do. You enjoy cleaning the dishes and putting food away because it makes your kitchen look nice and neat and it only takes a few minutes. Imagine yourself six months from now. You have developed a fun routine in your housework. Doing housework allows you to zone-out of your daily life and take time to enjoy yourself. You get so much satisfaction from cleaning and keeping a nice home. You do a great job and it shows. As you have begun to enjoy housework more and more, you have become better at it. Your work is more efficient and you are actually able to do the tasks quickly. You continue to enjoy all the different cleaning tasks so that you can live in a clean and comfortable home. And as you continue to drift you realize that you find joy in doing housework and that feels wonderful. We all have to do housework on a daily basis. And it would be so much easier to get chores done if we actually enjoyed housework! That is where hypnosis plays an important role. Hypnosis targets your subconscious mind to re-program the way you think. This hypnosis program, Discover the Joy of Housework Hypnosis MP3, can re-program YOU to enjoy tasks that you once despised doing. Right now you are probably thinking about the million things you need to get done around your home and you do not want to do it. Hypnotherapy re-programs you so that you enjoy doing housework. 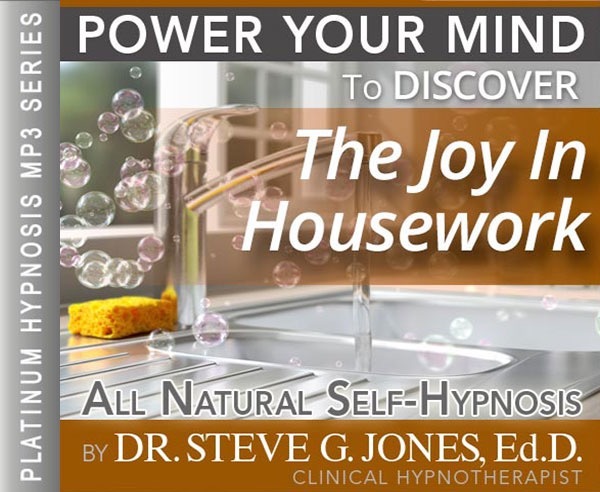 With the Discover the Joy of Housework Hypnosis MP3 recording you will want to be productive around your house and you will actually look forward to it! This list probably does not even scratch the surface of all the household chores you need to keep up with. Some days it can take a lot of motivation just to do one of those tasks. Lets face it, we all lead very busy lives and there are things we would rather be doing than working on housework. But, housework needs to be done, there is no way around it. Hypnosis targets your subconscious mind so that you feel motivated to get things done. No longer will you procrastinate on getting your chores done. You will feel motivated to accomplish your household chores. The great part is that you will enjoy accomplishing your goals around the house. You will feel a sense of accomplishment! And the great thing is that your house will be a lot cleaner! Listening to the Discover the Joy of Housework Hypnosis MP3 download in as little as one session can help you becoming more motivated in getting chores done around the house. We suggest that you listen to the hypnosis program for 21 nights in a row before going to bed. Listening to this program for 3 weeks will re-program your subconscious mind to enjoy housework. It takes three weeks to create a habit and in this short amount of time, you will discover the joy of housework! How is this program so successful? Because you will receive positive suggestions to change the way you think and feel about housework. Your former negative thoughts and emotions about housework will change into positive thoughts and emotions. You will be told to gain greater satisfaction from the housework you complete. You will feel a sense of accomplishment when you get chores done. This will help you feel more motivated and receive more enjoyment by accomplishing your household tasks.